As a US expat, there are a number of unique forms that you may be required to file, depending on your individual situation. One thing that is required of all US citizens who earned an income, regardless of where you live, is filing Form 1040, your US Tax Return. If you’re not sure about all the ins and outs of your expat taxes, this guide will prepare you with the details you need when it comes to filing Form 1040 with the IRS. For any type of income earned, you must have documentation to explain how it was earned and prove the amount you report on your US expat taxes is the true amount in the event of an audit by the IRS. Most of these documents will be sent to you by their respective distributors throughout the year, but keeping everything organized is key when it comes time to file your US expat taxes. Also, keep in mind that for Form 1040, you’ll almost always report based on the calendar year, from January 1 to December 31. Many other countries use different fiscal years for the tax and income documents you’ll receive. For instance, the fiscal year in the UK ordinarily runs from April 6 of one year to April 5 of the next year. In Costa Rica, the fiscal year runs from October 1 to September 30. Often, you will need statements for two fiscal years to determine the right amounts for a calendar year. Once you’ve gotten all of the income and deductions associated with your return, you’ll be ready to complete Form 1040 of your US expat taxes. To better demonstrate the process of completing the form, let us introduce you to Brian Expat. Brian and his wife, Sarah, are US citizens and that lived in Pennsylvania until they were married in 2000, and have been living in Thailand ever since. They also have two small children, Kevin and Audra Expat. Brian has been working for a US firm in Thailand since 2000. Brian has been earning just over THB 4,000,000, which translates into $115,000 at the year’s average annual exchange rate. Sarah, on the other hand, does freelance writing from her home office while taking care of their young children, which earned Sarah $10,000. They have a savings account back in the US that generated $1,000 in interest income. Their last source of income in 2015 was the sale of their second property back in the US, which landed a gain of $20,000. For their deductible expenses, Sarah went to school for a Thai course online that was administered by the US Department of Education. This cost $300 for six weeks and was work-related, as she is attempting to have articles published in Thai. She also has expenses from her business, including a new computer, that total $1,000. Lastly, Brian is still paying back his loans for his education back in Pittsburgh, allowing him to deduct some of the $200 in interest that he paid. 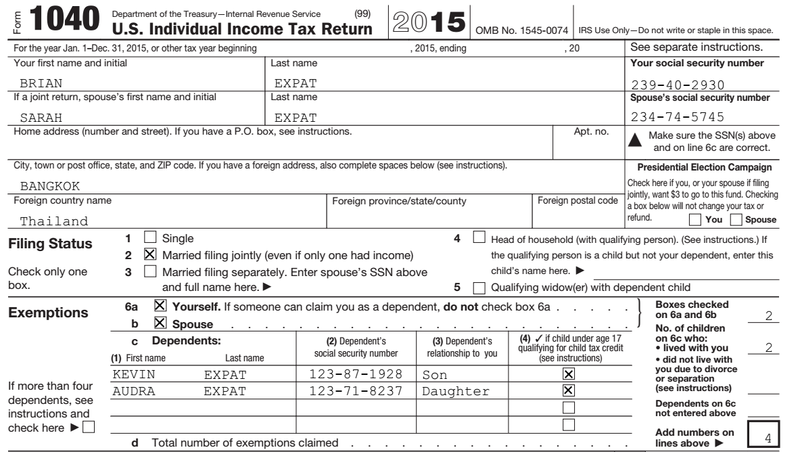 Armed with all of this information, we can successfully complete their Form 1040 for their 2015 US expat taxes. The first part of filling out Form 1040 is going to be completing the information section. This includes your name, your spouse’s name (if filing jointly) and any dependents that you may be claiming. Since Brian and Sarah are filing jointly this year, they will both be included in the section. Their children’s information is also provided. Next, Brian and Sarah are going to report their income on their US expat taxes by using the appropriate tax documents from Brian’s employer, Sarah’s accountant, the sale of their property and the bank statement proving the interest they earned. Because they are both US citizens who have lived abroad the entire year, they are eligible for the Foreign Earned Income Exclusion (FEIE). The FEIE will apply to each of them separately. For 2015, the maximum amount of FEIE was $100,800 per qualifying person. Because of this, Brian will be eligible to exclude $100,800 of his $115,000 in wages, and Sarah will be able to exclude the entire $8,700 she earned from freelance writing. They fill out Form 1040 as seen below. The next step is going to be identifying their Adjusted Gross Income for their US expat taxes. This includes deducting Brian’s student loan interest and half of the self-employment tax paid by Sarah (since Thailand and the United States do not have a Totalization Agreement). You can see how they filled out Form 1040 below. After calculating their total income and adjusting it for the appropriate deductions, Brian and Sarah have an adjusted gross income of $34,479. They are ready to calculate their tax owed on their US expat taxes. The first step in determining how much they’ll need to pay on their US expat taxes is determining taxable income. Since Brian and Sarah have two children, they are able to claim four exemptions on their income tax return, one for each child and one for each adult. Using the current rate of $4,000 per exemption, they are able to reduce their taxable income by $16,000. Additionally, Brian and Sarah are filing jointly, allowing them a standard deduction of $12,600. This reduces their taxable income to $5,879. Calculating your taxes owed on your US expat taxes can be intimidating, but the IRS provides you with useful tools to identify how much you owe. If you do not use the Foreign Earned Income Exclusion and you made less than $100,000, you can find your tax rate on pages 77-88 of the IRS’s Instructions for Form 1040. If you earned more than $100,000, you are going to need to use the worksheet found on page 89 of the IRS’s Instructions for Form 1040. However, things get even more complicated for expats who use the Foreign Earned Income Exclusion. The US uses graduated income tax rates – as income goes up, the rate of tax applied to the next dollar also goes up. The Foreign Earned Income Exclusion removes the “first,” or lowest taxed, dollars from the calculation. If there is taxable income left over after using the Foreign Earned Income Exclusion, it is taxed at the higher rates. If you used the Foreign Earned Income Exclusion, you’ll need to use the worksheet on page 43 of the IRS’s Instructions for Form 1040. The last steps in finishing Form 1040 for US expat taxes is signing the form, filing out the preparer’s information (if necessary), and sending it to the appropriate agency with the necessary payment. Now that Brian and Sarah have completed their taxes for 2015, they only need to focus on staying compliant with the IRS moving forward. The best way to do so is to stay aware of deadlines for expats, keep information for completing the returns to come in the future (including prior-year tax returns), and keeping up to date with the annual changes of tax policies. It is always good to talk to an expert about your US expat taxes to avoid time-consuming and costly mistakes. For the top expat tax tips and information you need to know, download a US expat tax guide for your specific situation. Ready to Get Started on Your Expat Taxes? It’s not too early – get started now with one of our expat-expert CPAs or IRS Enrolled Agents and get ahead of the tax deadlines in 2017!